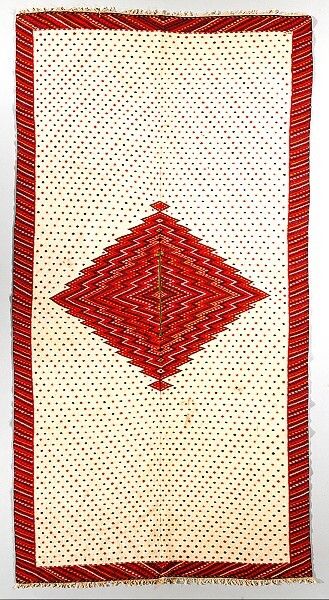 Most Saltillo-style textiles are sarapes. The Saltillo sarape was a practical garment because its fine weave shielded the wearer from both rain and cold. This peculiarly useful as well as ornamental garment is commonly carried dangling carelessly across the pommel of the saddle, except in bad weather, when it is drawn over the shoulders, after the manner of a Spanish cloak, or as is more frequently the case, the rider puts his head through a slit in the middle, and by letting it hang loosely from the neck, his whole person is thus effectually protected. By the late 18th century, Saltillo sarapes had become popular garments worn by men of all classes in the North American Southwest. 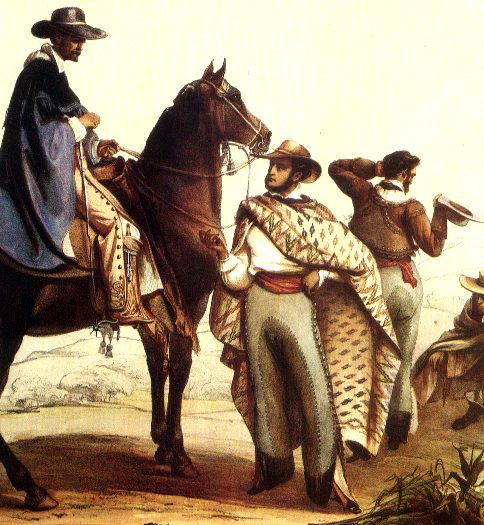 After Mexico gained its independence from Spain in 1821, these sarapes became a symbol of Mexican culture. Their popularity waned in the second half of the 19th century, as clothing styles changed and manufactured cloth became less expensive and more widely available. Top: "El sarape de los insurgentes." Chromolithograph, ca. 1830. Rebozos y sarapes de México, Virginia Armella de Aspe and Teresa Castello Yturbide, p. 171. Mexico City, GUTSA, 1989. Image courtesy of the GUTSA Corporation. Bottom: "Rancheros." Lithograph, 1834. Rebozos y sarapes de México, Virginia Armella de Aspe and Teresa Castello Yturbide, p. 143. Mexico City, GUTSA, 1989. Image courtesy of the GUTSA Corporation.